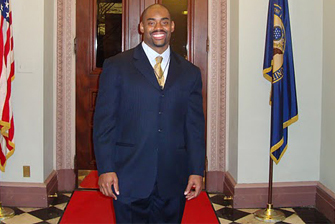 Today, National PTA Ambassador and 13-year National Football League veteran, Chris Draft, will lead several service projects in honor of Martin Luther King, Jr. Day of Service. He was named an MLK Ambassador of Service for the second consecutive year by the Corporation for National and Community Service. As a PTA Ambassador, Draft joined the millions of parents and families getting involved in their child’s education and school through PTA programs like Healthy Lifestyles Month and PTA Take Your Family to School Week. He continues his involvement today as an MLK Ambassador by participating in a full day of activities with other national service leaders in celebration of the King Holiday. Activities include participating in a discussion on community service with local and national leaders; attending an annual service at historic Ebenezer Baptist Church; and distributing food to homeless people and families. He is one of a few active NFL players contributing to this national effort. “At a time when community service and parent involvement are important now more than ever, Chris Draft truly represents the promise of Dr. Martin Luther King’s dream. Through his passion and commitment to children and families sets a great example for other professional athletes,” said National PTA President Charles J. “Chuck” Saylors. As a National PTA Ambassador, Draft is the Honorary Chair of PTA’s Healthy Lifestyles Month (November) - a month when PTA’s plan creative events that promote healthy habits among students and families. Draft visits schools throughout the country to meet with families, talk directly with kids about the benefits of being physically active and eating healthy. He also works with community organizations to host “Draft Family Fitness Day” to aid in the fight against health issues confronting youth and their families. For more information about National PTA Ambassadorships, visit PTA.org/ambassadors.